In retrospect, it is hard for me to imagine how anyone could have considered the dirigible as being practical (to say nothing of survivable) in a naval combat environment. In the 1920’s, however, the task of finding an enemy fleet in the vast reaches of the ocean was so difficult that an attempt to improve on the German efforts with lighter-than-air dirigibles seemed worth the effort . With the very limited range and endurance of aircraft at the time and with no hope that congress would fund an adequate number of scout cruisers, Adm. Wm Moffett, chief of the USN Bureau of Aeronautics, became convinced that larger and more powerful airships capable of carrying “parasite” aircraft to extend the scouting radius and to allow the dirigible itself to remain out of contact with the enemy might be the solution to the scouting problem. The huge ships proved to be extremely vulnerable to adverse weather conditions (all but one of the USN rigid airships were destroyed by weather) and proved less successful than hoped as scouts in fleet exercises. After Adm. Moffett was killed in the crash of Akron and Macon was lost after less than two years of service, the program was terminated. As beautiful and imposing as they were, dirigibles proved a developmental dead end, at least with the materials and design skill available in the 1920’s. For years I have hoped for a 1/700 dirigible kit to join my series of aircraft carriers in representing the history of USN naval aviation. 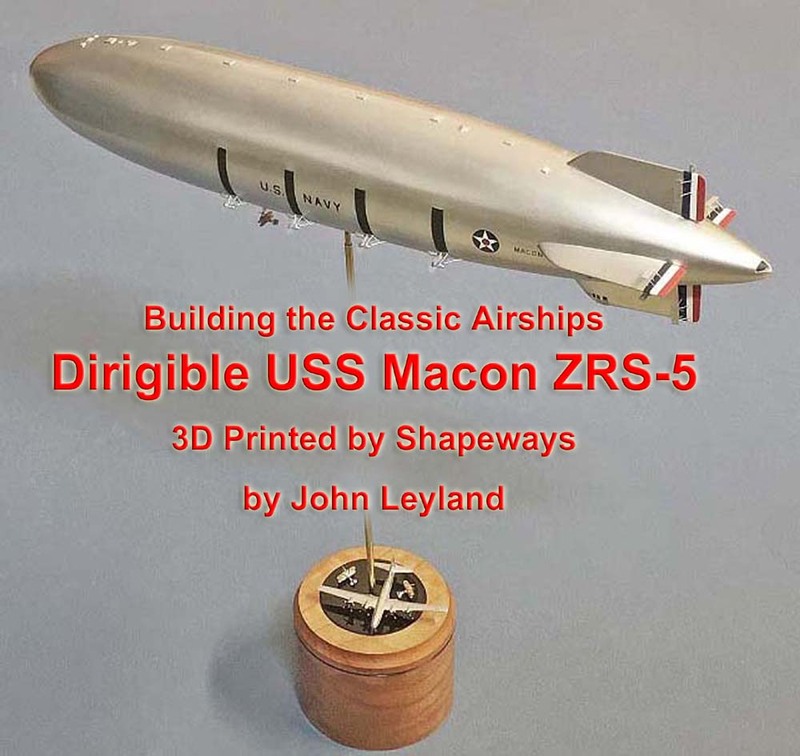 Finally Derek Harrington of Classic Airships offered models of the Akron and Macon 3D printed by Shapeways. The models have significant detail differences reflecting the different ships and I found them to be very accurate. The material used is called “Soft and Flexible” and lives up to its name, being very porous and indeed flexible. The hull comes in three pieces with the center section containing a very rudimentary representation of the aircraft hangar. The gondola and engine mount set and the aircraft set come as separate purchases.The limitations of 3D printing (at least as used here) made these parts a questionable value. The gondola is very well done. The engine mounts are far overscale, but by trimming off all of the supports I found that the basic shafts are designed to easily and perfectly align with the hull, solving the problem of aligning the eight drive shafts with the hull and making them worth the money to me. The aircraft fuselages are little gems, but all of the flying surfaces are too thick and have to be replaced with plastic sheet (my experience with other aircraft from Shapeways mastered by “Snafu” suggest that this is a matter of design rather than a limitation of 3D printing itself). Again, the fuselages were so much better than I could scratchbuild that they were worth the money to me. The hull has all appropriate openings and makes an attempt at details such as the dorsal gas vents and the large panels for an exhaust condensation system on the sides, but the soft and flexible material is just too coarse to represent fine detail. I cut off the gas vents and replaced them but chose to live with the condensers. I’m glad I did the project, but I would advise only experienced builders who REALLY want a dirigible to attempt it. I used AK interactive Matt Aluminum on the hull and White Aluminum for the lighter stripe along the line of the engines. The multiple engine braces and the rudder and elevator balance structures were made from sprue. I am satisfied with the model, but it wouldn’t stand up to IPMS level scrutiny. More of John Leyland's work.